On September 5, China’s Air Force launched drills against a “surprise attack” and shot down multiple missiles in the Bohai Bay — the innermost gulf of the Yellow Sea between China and North Korea. Two days before the drills, North Korea had just conducted its sixth nuclear test, which caused a strong tremor in China’s northern area. 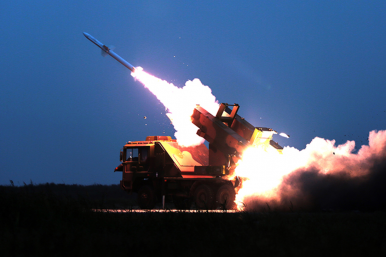 According to China’s official military website www.81.cn, during the drills, an anti-aircraft defense battalion of China’s air force shot down multiple simulated low flying missiles in the skies over Bohai Bay in response to a “surprise attack”. The report said without elaboration that it was the first time this kind of weapon had been used to shoot down low-altitude targets coming over the sea, and “the troops’ rapid response capabilities and actual combat levels have effectively been tested.” Although the report neither identified the battalion nor the specific weapon it used, it revealed that the troops had just participated in the military parade last month at the PLA’s Zhurihe training base in Inner Mongolia. On September 6, China’s Defense Ministry claimed that this was a routine exercise within an annual drill plan. “The goal is to improve the ability of the troops to carry out immediate tasks, rather than targeting any specific country,” it said. As The Diplomat has been following, North Korea’s latest nuclear test has triggered a big wave of criticism from the Chinese public. Many netizens demand that the Chinese government should deploy missile defense systems in China’s own territory. A Chinese netizen launched a survey about people’s attitude toward North Korea on Weibo. Within one day, 6234 Chinese netizens of Weibo participated. Interestingly, 65.6 percent of these participants believe that North Korea’s threat to China is bigger than that of the U.S. Army based in South Korea, since North Korea with nuclear weapons is more unpredictable and the nuclear explosion is disastrous to environment. Only 9.9 percent believe the opposite. 15.2% don’t think U.S. army based in South Korea is a threat to China at all, and the rest believe both threats are equally big to China. The random survey actually demonstrates the general trend of public opinion in China now in spite of the Chinese government’s constant censorship.